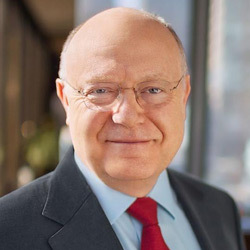 Pfizer’s chief executive Ian Read (pictured below) has said that he expects drug price rebates will eventually disappear in the US, and that could give drugs like arthritis drug Xeljanz and biosimilars a lift. Speaking on the company’s second-quarter results call, he said that eliminating rebates – one of the main themes of President Donald Trump’s blueprint for reducing drug pricing – would be a positive for the pharma industry overall. That is because it would do away with what is known as the ‘rebate trap’, where access to a new and innovative products is restricted because an incumbent product on a formulary is offering a large rebate – something that Read says directly affected JAK inhibitor Xeljanz (tofacitinib) and slowed its take-up in the market. Abandoning rebates could deliver a situation where drug prices fluctuate in line with healthcare inflation – and that shouldn’t affect Pfizer’s sales growth predictions, said Read. And while he wouldn’t be drawn on how quickly a rebate-free market could be created, he did say that discussions with Trump revealed a “huge sense of urgency” to act on the issue. 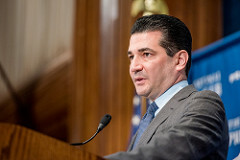 The move also has the support of FDA Commissioner Scott Gottlieb (pictured below), who said in May that removing the so-called ‘safe harbour’ for drug rebates under the Anti-Kickback Statute – which makes it illegal to pay an incentive for drugs or services covered by Medicare, Medicaid or other federal healthcare programmes – would “restore some semblance of reality to the relationship between list and negotiated prices, and thereby boost affordability and competition”. Kickback will come of course from PBMs – including Express Scripts, CVS Caremark and UnitedHealth – as well as insurers who argue that rebates are a diversion and that their negotiating tactics have kept overall drug costs in check. And some analysts say that as some PBMs already pass on 100% of rebates, the move could actually increase plan premiums. Read’s comments came shortly after Pfizer’s much publicised decision not to go ahead with planned mid-year price increases after being called out publicly by Trump. In an interview with CNBC, Read said that the decision was taken to defer price increases ahead of the conversation with Trump “because we wanted to have a positive relationship with the Hill and administration as we go through this blueprint”. The discussion over rebates and the future of drug pricing came amid a healthy set of figures for Pfizer, which reported an 4% increase in revenues to $13.5bn, driven by its innovative health unit and particularly Xeljanz – up 38% to $463m in the quarter – as well as breast cancer drug Ibrance (palbociclib) which rose 20% to $1bn and novel oral anticoagulant Eliquis (apixaban), which rocketed 47% to $889m.